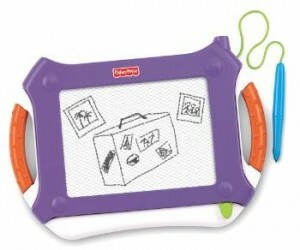 If you are looking for a way to entertain your kids while traveling, Amazon has the Fisher-Price Travel Doodler Pro for just $9.99. If you are a Prime Member, shipping is free! Just a month or so ago, this was $14.99. These are a nice size for little hands. My kids love to carry them around the house and draw.